« It’s a bird…. It’s a plane…. The UPS guy came this week with a new revision letter and another marked up manuscript from the editor working on my middle grade novel with Walker Books. I went through her notes, which are funny and brilliant and helpful and all things that an editor’s notes ought to be. And tonight, I sat down at my computer to open a new document. That is a whole lot of drafts. This manuscript is 47,536 words long. Multiplied by 18, that’s more than 855,000 words to chew on. That is a whole lot of words. And even though I’m excited about these revisions, sometimes I get a little sleepy just thinking about it. Tonight, these guys were my inspiration. Less than a week ago, they could fit on one of my fingernails. But they’ve been eating milkweed leaves, day and night. I don’t think they even stop to sleep. They have chewed through at least two big leaves a day — leaves that are more than twenty times the size of their bodies. They’ve been working their little striped tails off (do caterpillars have tails?? 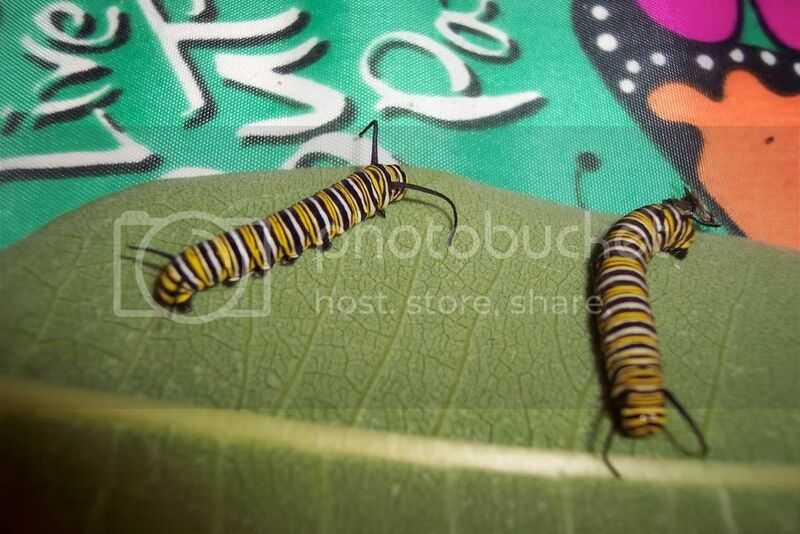 ), doing the hard work of getting ready to become butterflies. And they’re getting big now. They’re almost there. So am I. My line edits are due by the end of September. Like the caterpillars, my manuscript is becoming more fleshed out, more grown up. But it’s not quite ready yet. And I’m holding out for the butterfly. This entry was posted in Uncategorized and tagged revision. Bookmark the permalink. Both comments and trackbacks are currently closed.